This includes 24 2400 calorie bars * High in All Recommended VITAMINS (100% RDA Vitamin A, E, B5, B12, Pantothenic Acid, Niacin, Copper, C, D, Calcium, Folate, Biotin, Iodine, & Zinc. 4% RDA of Iron) * Meets SOLAS 74/83 Requirements * 5 Year Shelf Life * Non-Thirst Provoking * Withstands Temperatures of -22 deg F to 149 deg F * Absolutely No Cholesterol or Tropical Oils * U.S. Coast Guard Approved 160.046/A28/0 Finally!!! Not only a food ration that tastes great but it's also very nutritious. 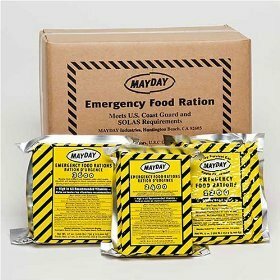 After years of research and development, the food bars are great tasting food rations that have a five year shelf life and are U.S. Coast Guard approved under the new licensing requirements of 1995. Great for extended Hiking Trips, Backpacking, Canoeing, Rafting, Eco Challenges, Camping, Emergency Rations, Short Term Weight Loss, Survival of Life at Sea, Earthquake Preparedness, Blizzards, Floods, Disaster, Emergency food supply or any Survival situation. Make no compromise - Get the very best! Nutritional Information Serving Size: 3oz. 85g Servings Per Container: 6 (2400) Amount Per Serving Calories 400 Calories from Fat 150 % Daily Value* Total Fat 17g 26% Saturated Fat 4g 20% Cholesterol 0mg 0% Sodium 35mg 1% Total Carb 55g 18% Dietary Fiber 2g 8% Sugars 14g Protein 7g Trans Fatty Acids 0g Vitamin A 100% Vitamin C 100% Vitamin D 100% Vitamin E 100% Vitamin B5 100% Vitamin B12 100% Iron 4% Thiamin 100% Niacin 100% Folate 100% Riboflavin 100% Pantothenic Acid 100% Biotin 100% Iodine 100% Copper 100% Zinc 100% *Percent Daily Values are based on a 2,000 calorie diet. Your daily values may be higher or lower depending on your calorie needs. Ingredients: Enriched Flour, Vegetable Shortening, Sugar, Corn Syrup, Soy Flour, Cornstarch, Potassium Sorbate, (Vitamins listed above), Artificial Lemon Flavoring, Artificial Vanilla Flavoring, Artificial Butter Flavoring, Artificial Coloring (Egg Shade).